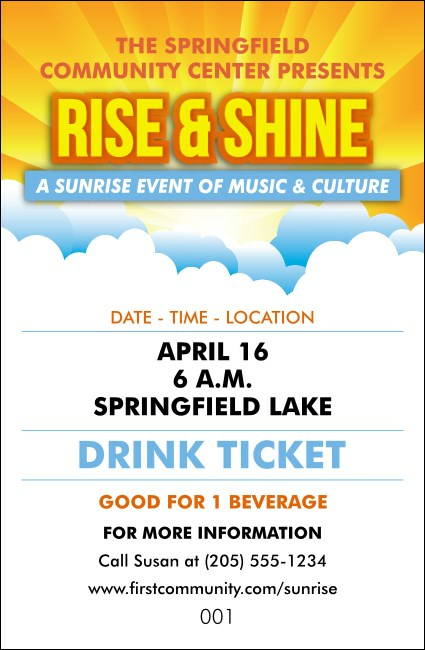 Whether it’s coffee, tea, or OJ that wakes your guests up in the morning, give them what they crave when you print Sunrise Clouds Drink Tickets for your early morning event. Encourage your guests to celebrate the sun with tickets that feature a glowing sun rising from behind fluffy white clouds. Let your light shine with the right ticket at TicketPrinting.com.